Executive Coach Builders is the second largest manufacturer of limousines in the world. Their 100,000 sq. ft. manufacturing facility needed room for more storage and office space without losing production area. Challenge: When production demands increased from about 50 limousines a year in the early 90s to over 600 limousines last year, Executive Coach Builders needed to add more office and storage space. Solution: Unwilling to sacrifice valuable floor space in their production area, they decided to build up to take advantage of unused space. 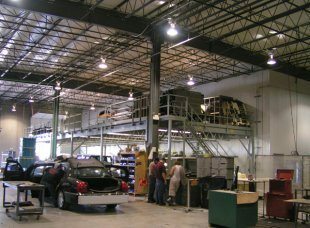 Panel Built Delivers: They chose Panel Built to design two custom powder coated mezzanines with wide span support to maximize the work area below. 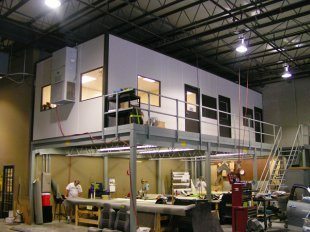 For even more space, a three room modular office system was added to one mezzanine. Project Specs: One 14×35 In-plant modular office on an 18×35 powder coated structural steel mezzanine with OSHA stair system and hand rail. One 24×82 powder coated structural steel mezzanine with OSHA stair system and hand rail.